I Found A Pot of Gold Cash Gold! Let’s be real — who goes to pawn shops anymore? I know the last time I did, it was to see if some thief had traded my precious 5th grade band clarinet for a hefty load of cash. My mission was very unsuccessful. However, I learned recently that pawn shops can serve a real purpose. And that is to be renovated into restaurants that serve up amazing eats. If you haven’t tried Gold Cash Gold in Corktown yet, then you’re missing out on a true Detroit jackpot. After a long week, this is the the ideal spot to grab some friends and sit around one of the many wooden tables. My three girlfriends started off the night with some fun, refreshing cocktails. GCG also has a great selection of wine and beer, so I opted for a glass of crisp Pinot Noir for myself. Next, we swooned over their funky menu, adamant about finding an app to please everyone’s palettes. 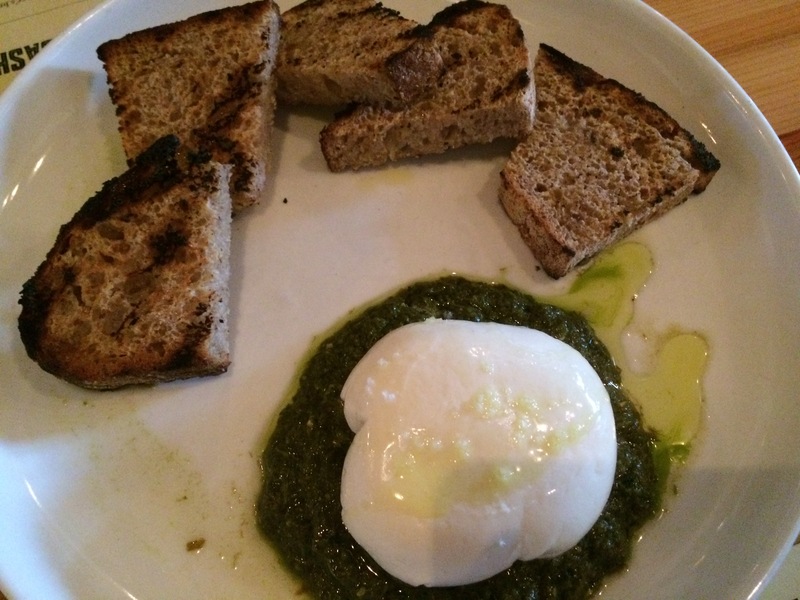 While I was turned down for my vote on the chicken liver mousse (our waiter highly recommended it), we settled on a seasonal dish of Burrata and ramp pesto, served with warm, sliced bread. This was a melt-in-your-mouth, heavenly delight. Before we knew it, our entrees arrived. Again, I was the odd one out, but I got to sample some of my friends’ pickle brine fried chicken (all three of them ordered it)! 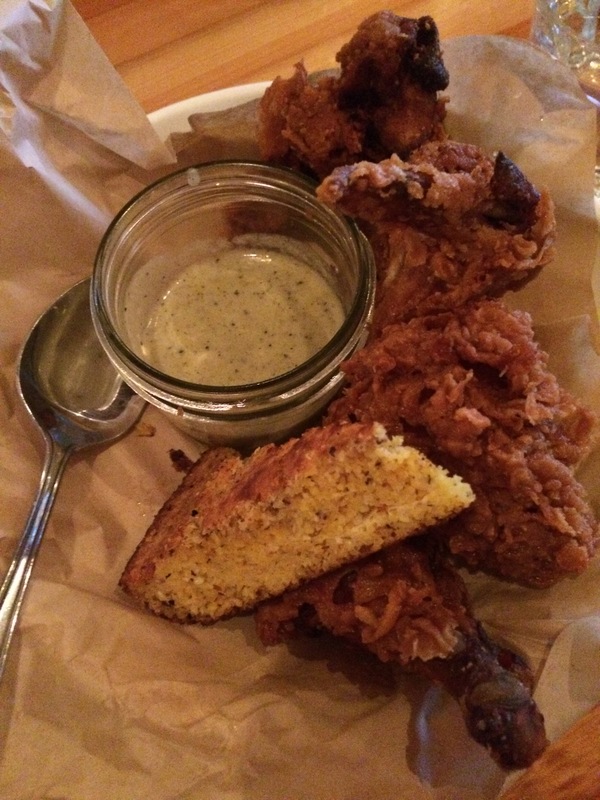 This was some mighty fine, crispy, crunchy chicken with so much flavor my mouth could barely handle it. This was a huge portion, and came with some stellar gravy and cornbread. 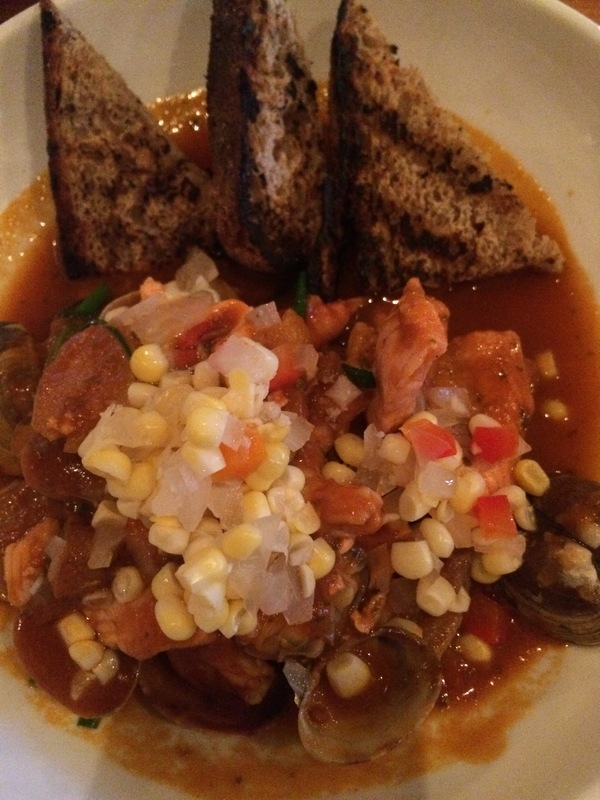 My Cioppino (a tomato-based stew with seafood and chicken sausage), was a perfect size for a gal like me. I pretty much devoured it all, and reluctantly shared a shrimp or two. As an added indulgence, we ordered some piping hot, thick-cut french fries. It was obviously necessary. I do wish I could say we had room for dessert, but that will have to wait. Next time, I’m heading to Gold Cash Gold for brunch! Chicken and waffles, anyone? Final words of wisdom on GCG: Be bold, be prepared to wait, and just enjoy! Hours: Closed Mon., Tues. – Th. 11 a.m. – 3:30 p.m., 5 p.m. – 11 p.m., Fri. 11 a.m. – 3:30 p.m., 5 p.m. – 12 a.m., Sat. 10 a.m. – 3:00p.m., 5 p.m. – 12 a.m., Sun. 10 a.m. – 3 p.m., 5 p.m. – 11 p.m.
Click here to view their fabulous website for more info!